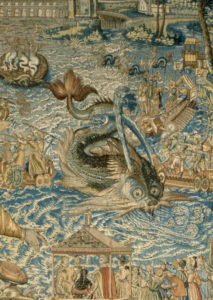 Hall of Maps at the Uffizi Gallery in Florence, Italy. 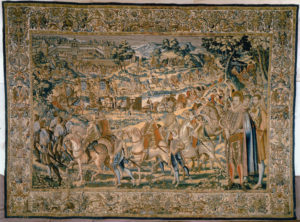 experts about their process and tools. 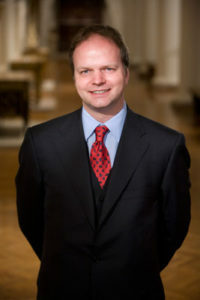 Host: Todd Barron, The Barron Group, UBS Financial Services, Inc. 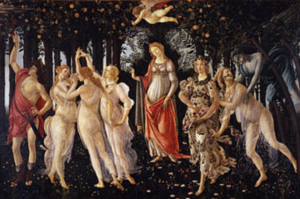 Experience Florence as only the Friends of the Uffizi can! 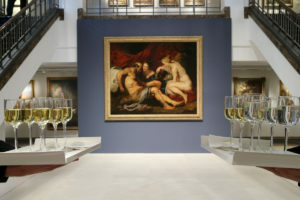 The cocktail party launched the first trip for The Friends of the Uffizi to New York City. 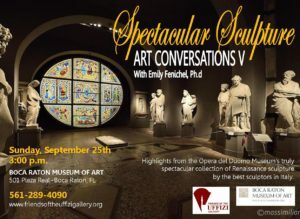 Program: A reception and private tour: Discussion with art conservation experts about their process and tools. 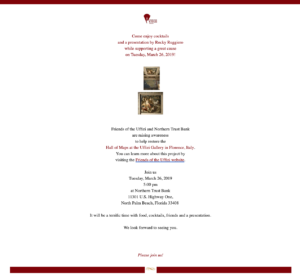 Program: Tour and Lecture by Gordon A. Lewis, Jr.
to welcome and honor American donors who support Friends of the Uffizi. 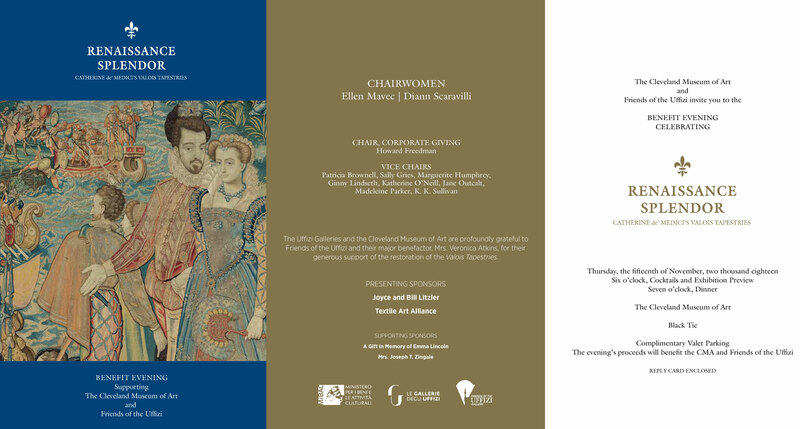 A private reception for Friends of the Uffizi Gallery members and special guests. 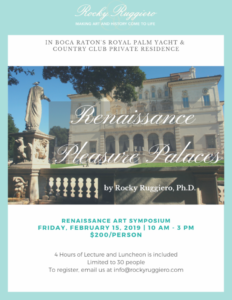 Program: Annual Brunch with special guest and presenter, Robert B. Simon, PhD Discovery of Leonardo da Vinci’s “Salvator Mundi” painting. 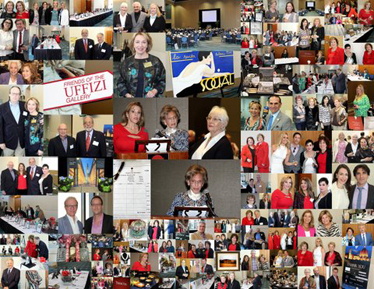 Click here to view event photos. 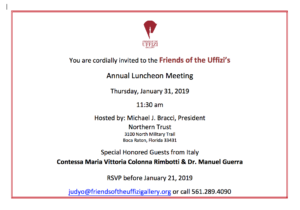 Board members Daniela Di Lorenzo and Bruce Crawford hosted this private luncheon for the board of Friends of the Uffizi Gallery and special guests president Contessa Maria Vittoria Colonna Rimbotti and vice president Dottore Emanuele Guerra.Click here to view event photos. 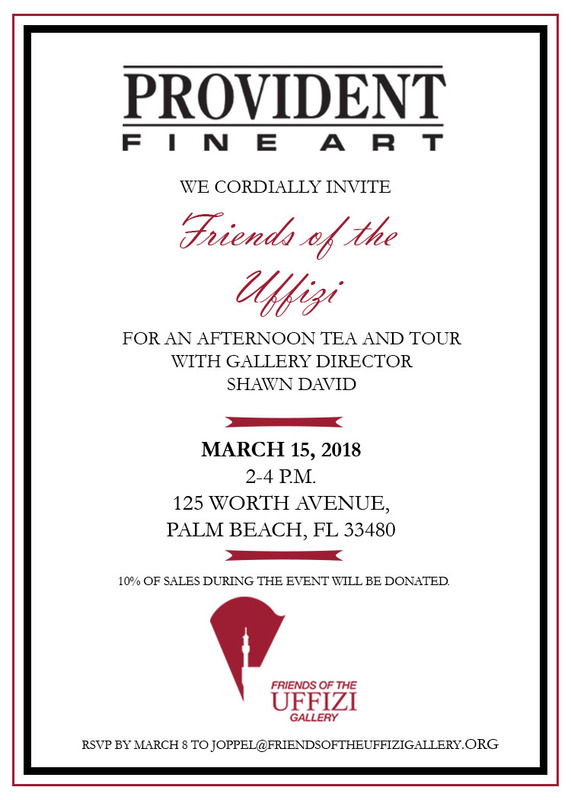 Friends of the Uffizi Gallery held their annual private member meeting and luncheon at a private Palm Beach home and honored president Contessa Maria Vittoria Colonna Rimbotti and special guest Adolfo Barattolo, Consul General to Italy in Miami. Click here to view event photos. 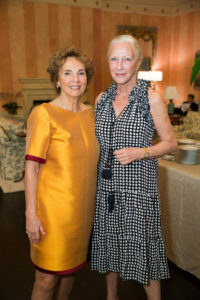 Host: Mrs. Veronica Atkins, whose foundation is funding the restoration of the Uffizi’s “Apollo with Lyre” statue, hosted a private event at her beautiful waterfront home to honor Contessa Maria Vittoria Colonna Rimbotti and members and special guests of Friends of the Uffizi Gallery. 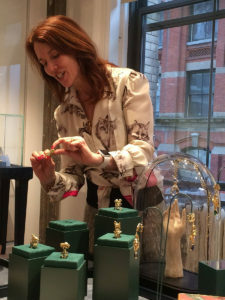 Click here to view event photos. 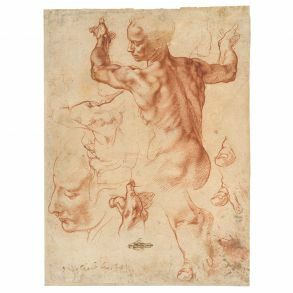 The Lighthouse ArtCenter Museum & Gallery hosted a lecture that featured conservator Gordon Lewis, president and founder of the Fine Arts Conservancy and member of the board of directors of Friends of the Uffizi Gallery. 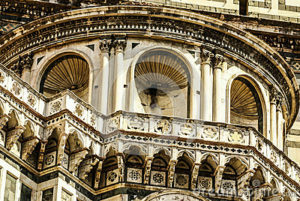 Mr. Lewis lectured on the challenges that have been faced by the Uffizi Gallery throughout the years, including looting by the Nazis during World War II. He lectured to a standing-room only crowd. 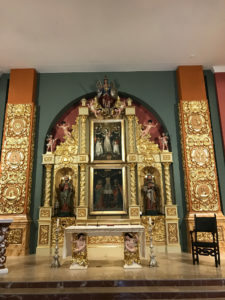 Friends of the Uffizi Gallery partnered with the Norton Museum of Art to present an Italian-themed Art After Dark event. 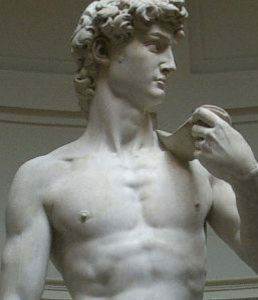 During the evening, guest’s enjoyed Italian music, art, food, wine and song. 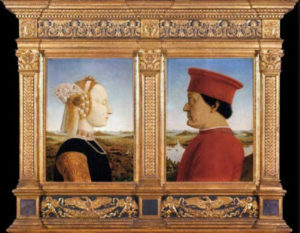 Lisa Marie Browne, executive director of Friends of the Uffizi Gallery and Gordon Lewis, board member and founder of the Fine Arts Conservancy, provided lectures on the Italian Renaissance and the Uffizi Gallery. Both lectures were full to capacity. 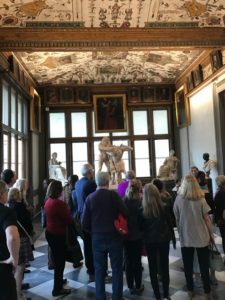 Friends of the Uffizi Gallery were given a private tour of the exhibit, “José Manuel Ballester: Concealed Spaces” with the show’s curator Francine Birbragher-Rozencwaig, PhD. 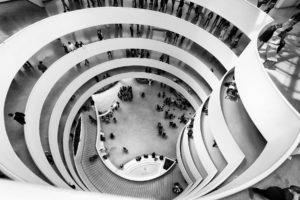 Prize-winning Spanish photographer José Manuel Ballester (Madrid, 1960 -) is known for his large-scale works that are connected by key concepts such as space, light and time. 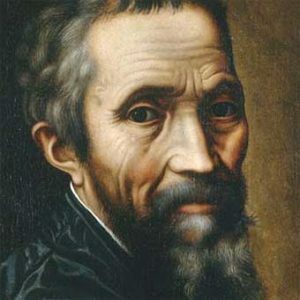 Many use historical images associated with the old masters that are deconstructed to become current comments on the world of art.Click to view event photos on our Facebook page. 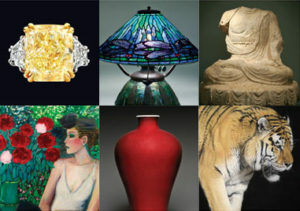 The Fine Arts Conservancy is a leading source for the fine and decorative arts and furniture conservation and restoration, museum framing, collection management, insurance claims and art appraisals. 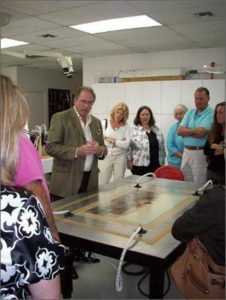 They hosted a private reception and tour of their state-of-the-art facility for members of the Friends of the Uffizi Gallery. 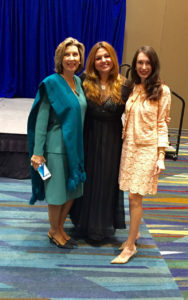 Click to read more about this event and to view event photos on our blog. 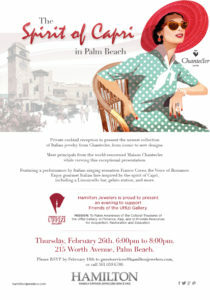 Host: Palm Beach Jewelry, Art & Antique Show. 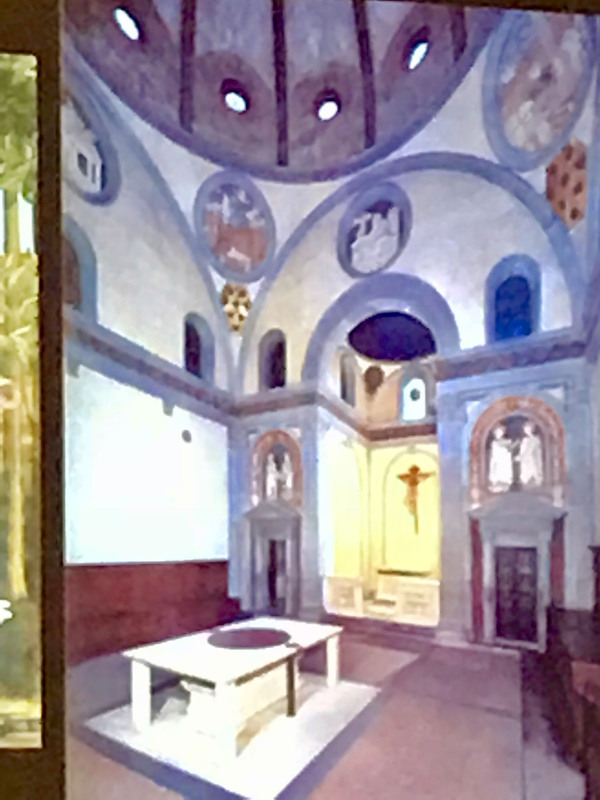 Program: Gordon Lewis of the Fine Arts Conservancy lectured on, Against All Odds: The Dark Side of Man, The Forces of Nature and the Uffizi Gallery and Frank Cerabino performed on the fisarmonica. 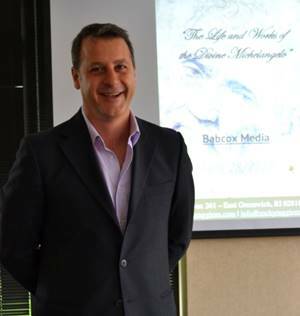 The brunch was made possible by the generous donation of member Joseph Raskauskus. 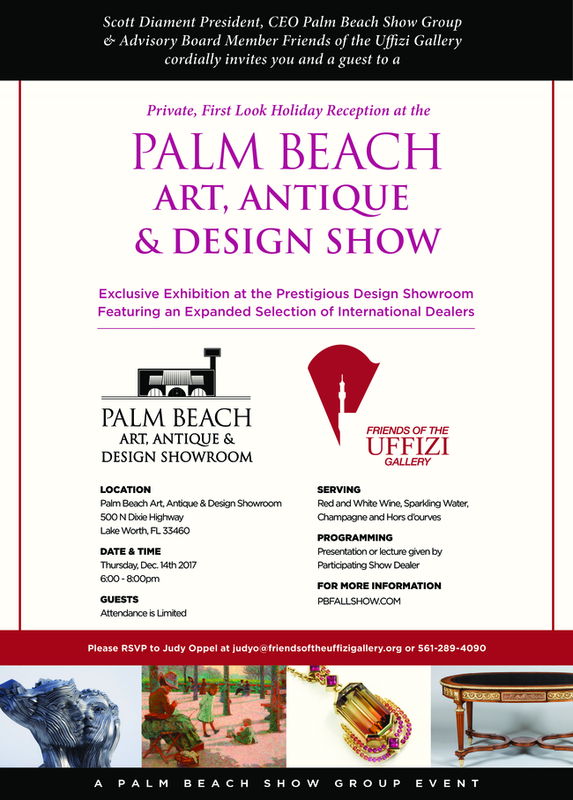 Friends of the Uffizi Gallery participated as one of the main charity partners for the annual Palm Beach Jewelry, Art & Antique Show. 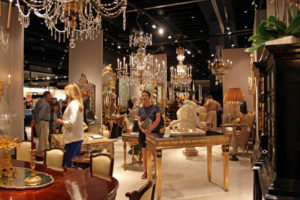 This prestigious annual fair features the collections of more than 180 renowned international dealers and attracts tens of thousands of private collectors, museum curators, investors and interior designers. 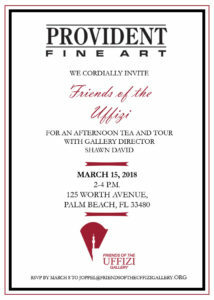 Friends of the Uffizi Gallery held their annual meeting and luncheon at a private home in Palm Beach. 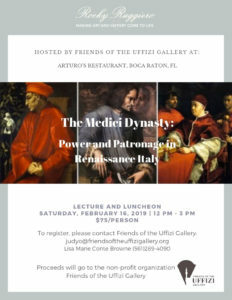 Friends of the Uffizi Gallery partnered with Società Dante Alighieri in Miami to present a lecture with Contessa Maria Vittoria Colonna Rimbotti. 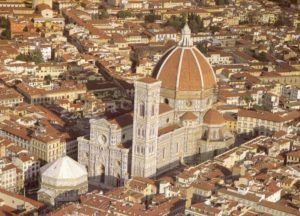 The Contessa’s lecture was called, “Patronage of the Arts from the Medici to the Friends of the Uffizi Gallery” and it was about the Renaissance and Baroque art and rich history of Italy’s Uffizi Gallery. Over 100 people attended this event. 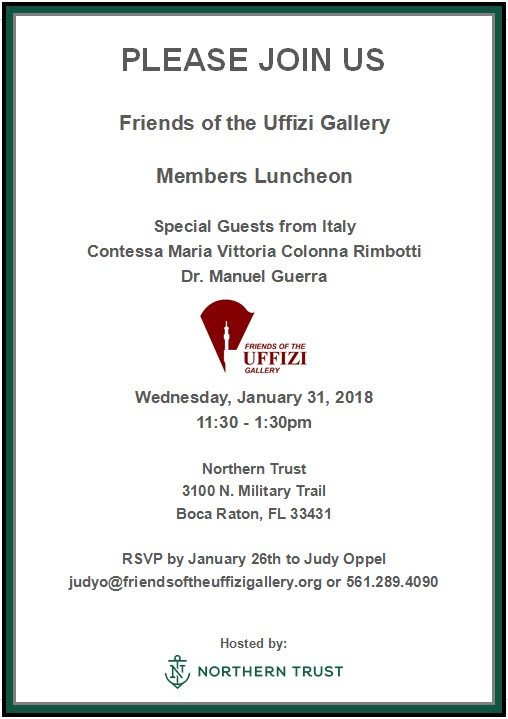 The Honorable Adolfo Barattolo and Signora Barattolo hosted Contessa Maria Vittoria Colonna Rimbotti and the Friends of the Uffizi Gallery at a private luncheon in their beautiful waterside home. 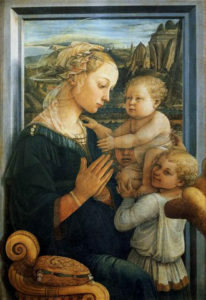 Friends of the Uffizi Gallery partnered with the Norton Museum of Art to present an Italian-themed event to celebrate the 2013 “Year of Italian Culture” in the U.S. 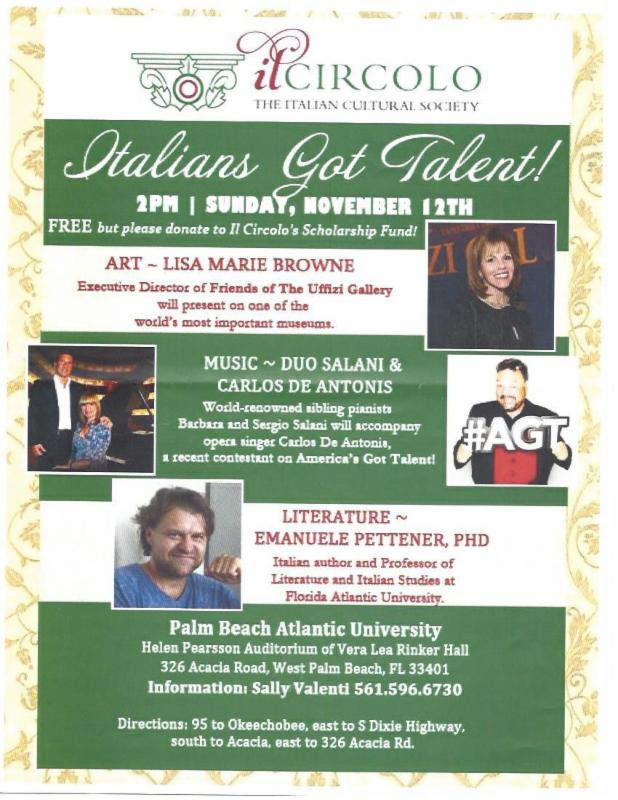 The evening included Italian food and wine, an introductory Italian language lesson and special performances by the Palm Beach Opera and Frank Cerabino on the fisarmonica. 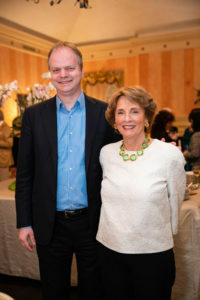 Friends of the Uffizi Gallery hosted a private luncheon with special guest, Signore Adolfo Barattolo, Consul General of Italy in Miami for members and special friends prior to the 2012 Florentine Weekend. 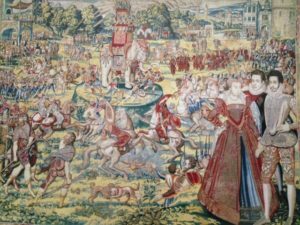 Contessa Maria Vittoria Colonna Rimbotti was invited to this historic and exclusive club to speak to their members about the important work done by the Friends of the Uffizi Gallery. 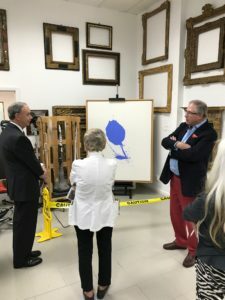 A tour of the Fine Arts Conservancy’s Palm Beach studio and discussion with art conservation experts about their process and tools. 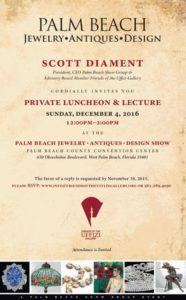 A board luncheon held at a private Palm Beach club and hosted by Daniela Di Lorenzo and Bruce Crawford. 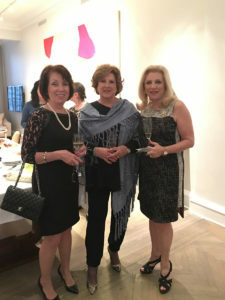 Lisa Marie Conte Browne and Mary Jo Zingale hosted this Palm Beach cocktail party. 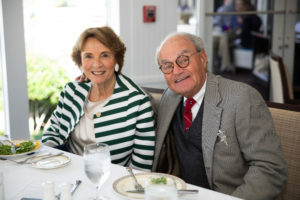 Daniela Di Lorenzo and Bruce Crawford hosted the Board of Directors for a luncheon at the Palm Beach Yacht Club to bid farewell to Contessa Maria Vittoria Rimbotti and Dottore Manuel Guerra at the close of their annual winter visit to Palm Beach. 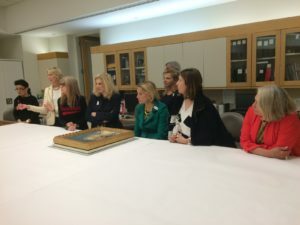 Also in attendance were Lisa Marie Browne, Executive Director, Danielle Amato-Milligan, Diana Bell, Diann Scaravilli, Holly Hadley, Rebecca Dunn, Gordon Lewis and Director of Operations Mary Jo Zingale. 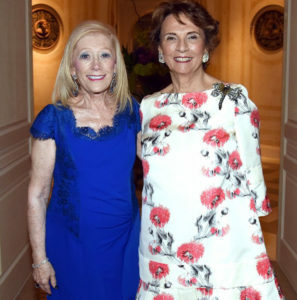 Contessa Maria Vittoria Colonna Rimbotti hosted board and members for a special weekend that included dinners and lunches in historic villas and special behind-the-scenes tours of the Uffizi Gallery and other cultural sites throughout the city. This event was organized with the Nantucket Historical Society during their annual Antique Show at the home of Rick and Marie Wackenhut. Mike Bracci, Northern Trust Bank Regional President, hosted this event at their company’s Royal Palm Way corporate office. 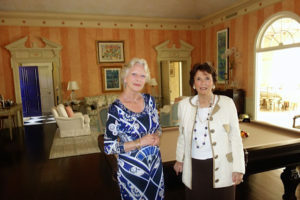 A perfect setting for the Annual Meeting of the Friends of the Uffizi Gallery was the beautiful Palm Beach home of Mrs. Patrick Parker. Guests sipped and dined in the courtyard and covered canopy of the pillared, flower-filled terrace as President Maria Vittoria Colonna Rimbotti and VP Manuel Guerra welcomed guests and members. 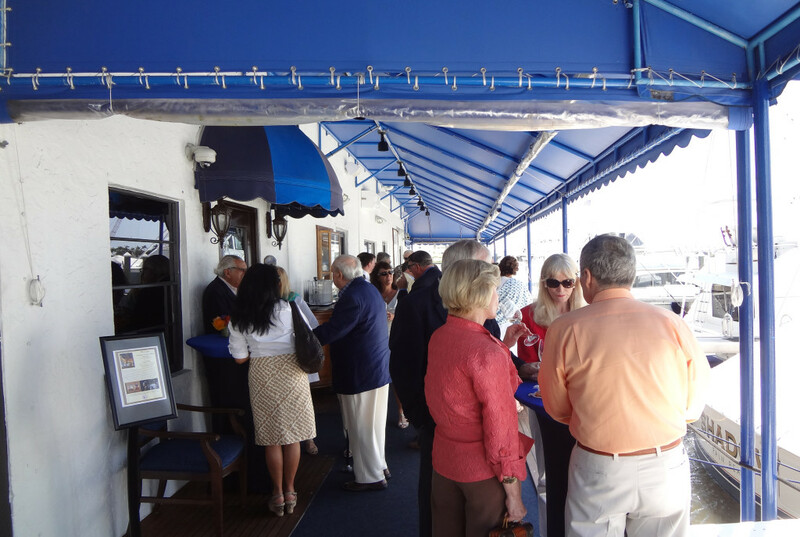 Board of Directors Treasurer, Bruce Crawford and Secretary of the Advisory Board, Daniela Di Lorenzo, hosted a beautiful luncheon at the Palm Beach Yacht Club for the board of directors. 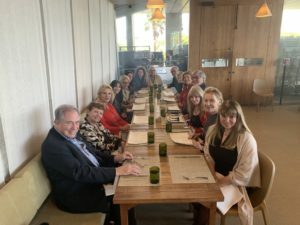 Karen McGarry, Diana M. Bell, Mary Jo Zingale, Lisa Marie Browne, Helen H. Abell, Dr. Manuel Guerra and Rebecca Dunn were all present. 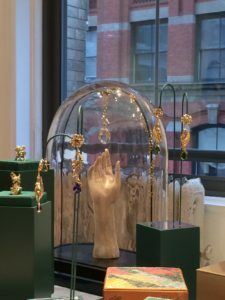 John Domenico and Ellen Clarke of US Trust, Bank of America, Private Wealth Management greeted special guests and members of the Friends of the Uffizi Gallery during a private dinner at beautiful Club Colette. 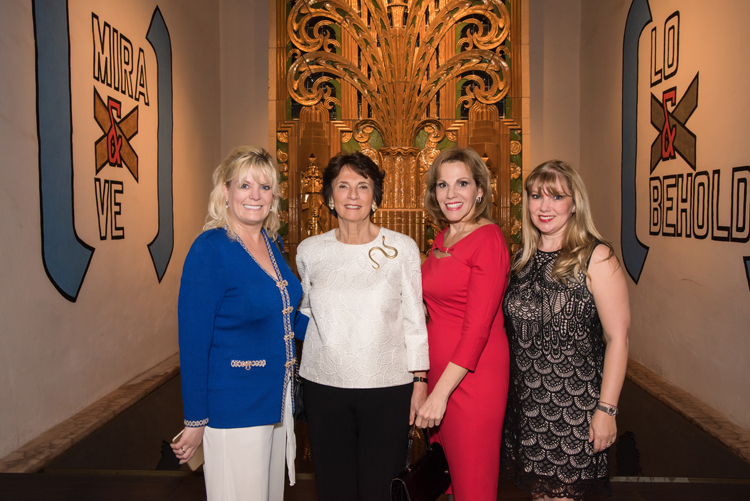 Honored Guests included Dr. Manuel Guerra, VP of the Friends of the Uffizi Gallery and Contessa Maria Vittoria Colonna Rimbotti. 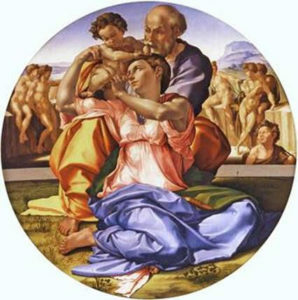 Gordon Lewis, President of the Fine Arts Conservancy, lectured on the history of the Uffizi Gallery. 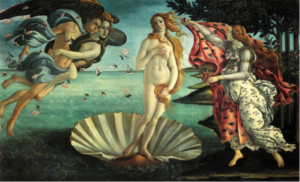 An exclusive event organized by Sotheby’s and held in their private dining room during Old Masters Week to honor the Friends of the Uffizi Gallery. 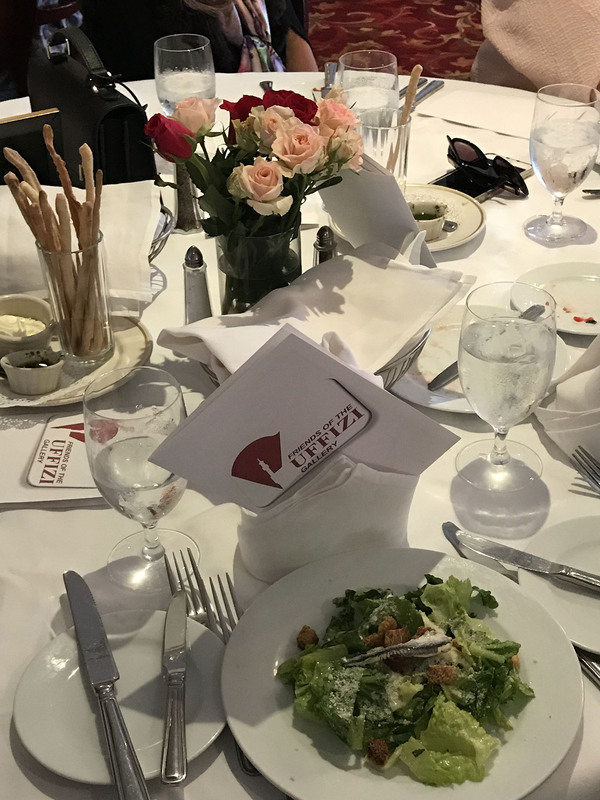 Club Colette in Palm Beach, Florida was the setting for an elegant luncheon organized and sponsored by National city Bank for their private clients and members of the Friends of the Uffizi Gallery. 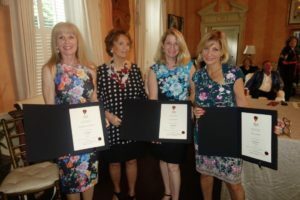 Distinguished guest speakers included Bill Besch, Honorable Anne-Imelda Radice, Robert Koo and Contessa Maria Vittoria Colonna Rimbotti. 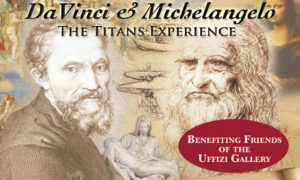 A private luncheon hosted by Mary Jo Zingale, Director of Operations for the Friends of the Uffizi Gallery, at Baricelli Inn in Cleveland, Ohio. 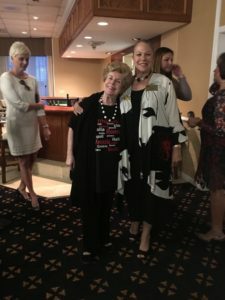 Showcasing the wonderful hospitality of the beautiful homes in Cleveland, Diann Scaravilli, Chairman of the Advisory Board and Northern Trust of Cleveland hosted a group of members and supporters in Scaravilli’s Pepper Pike home. 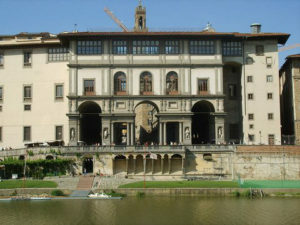 Contessa Maria Vittoria Colonna Rimbotti spoke to the guests about the history of the Uffizi Gallery. 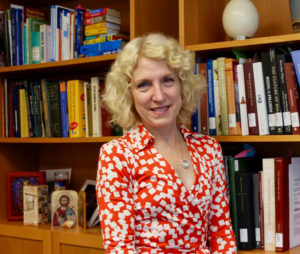 A private luncheon and lecture hosted by Liska Langston of Northern Trust Bank. 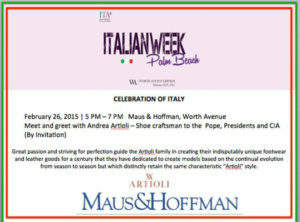 A private cocktail reception and presentation about the Italian Renaissance, held at a private home, to introduce the newly formed Friends of the Uffizi Gallery to the Palm Beach community. Ellen Clarke welcomed members and guests for a private luncheon at Boca Raton’s Ruth’s Chris Restaurant including Antonio Natali, Director of the Uffizi Gallery, Contessa Maria Vittoria Colonna Rimbotti, President of the Friends of the Uffizi Gallery, Dr. Manuel Guerra, VP, Friends of the Uffizi Gallery and Dr. Patrizia Asproni, Secretary of the Amici degli Uffizi. Ellen Clark graciously invited guests to a private dinner and lecture on “The Art and Passion of the Italian Renaissance.” Guest speakers included Antonio Natali, Director of the Uffizi Gallery, Contessa Maria Vittoria Colonna Rimbotti, Dr. Manuel Guerra, VP of the Friends of the Uffizi Gallery and Dr. Patrizia Asproni, Secretary of the Amici degli Uffizi.